When we visited Corsair in the beginning of the year in Fremont, California the company told us about plans to move into the case market. There weren’t actually pictures or prototype builds available at that time which is why we didn’t mention it. Now first pictures are available and Corsair will even show a first prototype sample at this year’s CeBIT which begins tomorrow. We made our way over to Germany to cover the show and want to show pictures from this case already today. There is no name yet for the case and first real samples will be ready in the second quarter of 2009. Tomorrow we will see the mockup sample and there will be more pictures from us as well. and then if I could just take out those damned LED's. I wish I could just run my PC like a PC without a bajillion blue lights all over it. If this is below 230 dollars I will definitely look at it. The real pics show it as quite massive. I don't know if a removable motherboard tray is necessary,but it would be nice. More back fans,aswell as having 8 expansion bay slots. 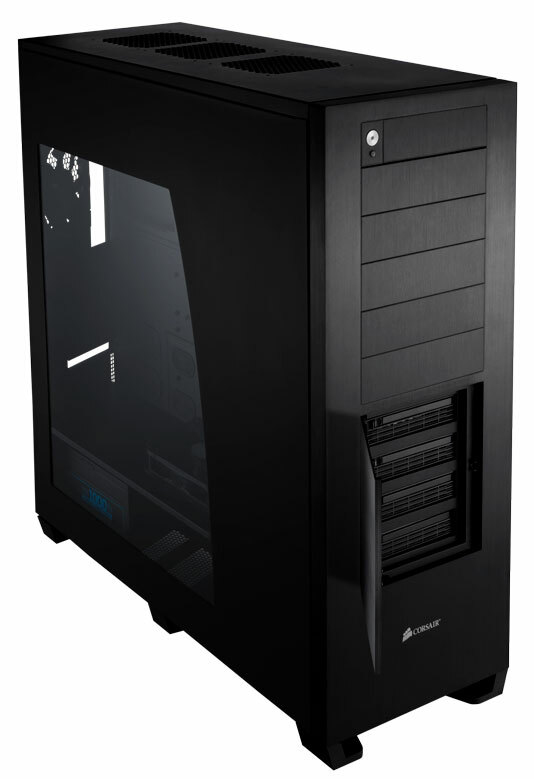 A good-looking compromise between Lian Li and Silverstone minimalism, it appears. Although I can't say I'm happy with that 120mm fan sitting in the middle of the case, or with the three 120mm fans in the roof. Is the air intake through the meshed bottom?